The TE MANU yacht is a 162ft / 49.4m luxury yacht for sale, built and launched by yacht builder CODECASA. Delivered to a proud yacht owner in 1998 and refit in 2017, this luxury yacht sleeps up to 14 guests in 6 staterooms and has accommodations for 11 crew. She has a beam of 31ft / 9.5m, a draft of 10.5ft / 3.2m, and she measures in at 612 gross tons. Her hull is steel and her decks are teak. Her max speed is 17 knots and cruising speed is 15 knots. She is propelled by Caterpillar engines at 2,200 hp each. Her interior design is by Franco & Anna Della Role/Betsy Godfrey with exterior styling by Franco & Anna Della Role and Betsy Godfr. When it comes to purchasing a luxury yacht, like the yachts themselves, pricing may vary greatly. When evaluating the TE MANU yacht price and similar yachts for sale, the industry knowledge of Merle Wood & Associates will help you with everything you need to know in order to make the right decisions when buying a luxury yacht. If you’d like to know the availability of the TE MANU yacht for charter and the weekly rate, view the TE MANU yacht charter price and summary. For a complete list of amenities available or for a first-hand review of the TE MANU, simply request assistance from our qualified luxury yacht brokers. Our team of yacht specialists travel the world visiting and experiencing yachts for sale. Because of this, they have expert knowledge about every yacht for sale, and can provide further details about the features and amenities aboard TE MANU. We provide accurate specifications, details and current information on yachts for sale around the world. Read the detailed TE MANU yacht specs and analysis. Read more about the cruising grounds, winter or summer itinerary and the last known TE MANU yacht location. 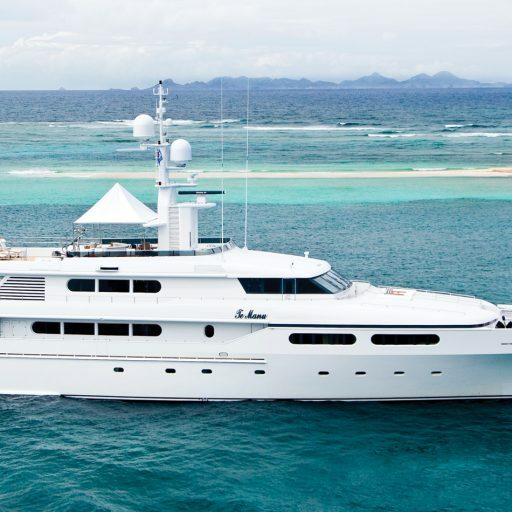 For more information and expert knowledge about the TE MANU luxury yacht for sale, from a qualified yacht broker, simply contact the luxury yacht brokerage firm of Merle Wood & Associates for assistance. The TE MANU has been displayed to provide our visitors the most current and accurate data for this luxury yacht. If you would like to report an error or have additional information, including photos and video, related to the TE MANU, please contact our luxury yacht intelligence team.